Download "Designing Business Intelligence Solutions with Microsoft SQL Server 2012 Course 20467A; 5 Days"
1 Lincoln Land Community College Capital City Training Center 130 West Mason Springfield, IL Designing Business Intelligence Solutions with Microsoft SQL Server 2012 Course 20467A; 5 Days Course Description This five-day instructor-led course teaches students how to design and implement a BI infrastructure. The course discusses design, installation. The course discusses design, installation, and maintenance of a BI platform. This course maps to skills and knowledge measured by Microsoft Exam , and in conjunction with on-the-job experience, can help prepare you for the exam. 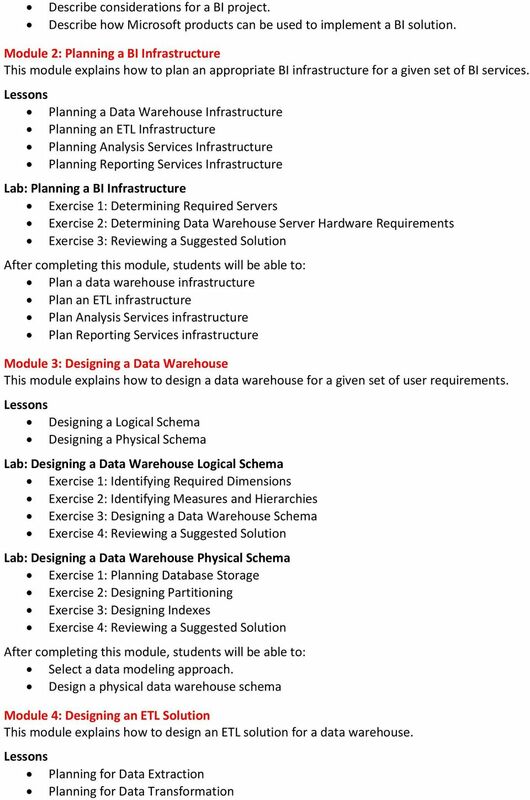 Prerequisites Before attending this course, students must have: A basic understanding of dimensional modeling (star schema) for data warehouses. The ability to create Integration Services packages that include control flows and data flows. The ability to create a basic multidimensional cube with Analysis Services. The ability to create a basic tabular model with PowerPivot and Analysis Services. The ability to create Reporting Services reports with Report Designer. The ability to implement authentication and permissions in the SQL Server database engine, Analysis Services, and Reporting Services. Familiarity with SharePoint Server and Microsoft Office applications, particularly Excel. 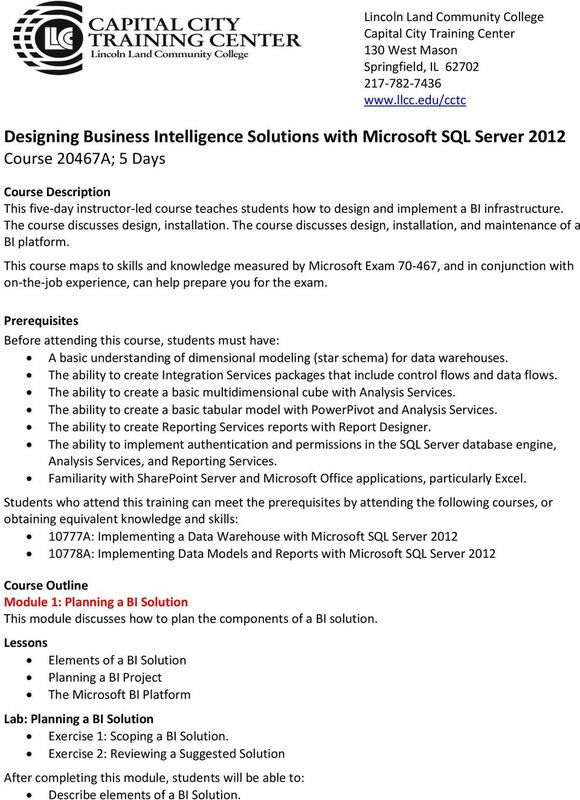 Students who attend this training can meet the prerequisites by attending the following courses, or obtaining equivalent knowledge and skills: 10777A: Implementing a Data Warehouse with Microsoft SQL Server A: Implementing Data Models and Reports with Microsoft SQL Server 2012 Course Outline Module 1: Planning a BI Solution This module discusses how to plan the components of a BI solution. Elements of a BI Solution Planning a BI Project The Microsoft BI Platform Lab: Planning a BI Solution Exercise 1: Scoping a BI Solution. Exercise 2: Reviewing a Suggested Solution Describe elements of a BI Solution. 3 Planning for Data Loading Planning for SSIS Package Deployment Lab: Designing an ETL Solution Exercise 1: Reviewing Data Sources Exercise 2: Creating Source-to-Target Maps Exercise 3: Planning ETL Processes Exercise 4: Reviewing a Suggested Solution Plan data extraction in an ETL solution. Plan data transformation in an ETL solution. Plan data loading in an ETL solution. Plan SSIS package deployment Module 5: Designing Analytical Data Models This module explains how to design analytical data models for specific BI scenarios. Options for Analytical Models Data Model Design Considerations Lab: Comparing Analytical Data Models Exercise 1: Creating a Multidimensional Model Exercise 2: Creating a Tabular Model Lab: Designing Data Models Exercise 1: Designing Dimension Attributes Exercise 2: Designing Data Model Aggregations and Storage Exercise 3: Reviewing a Suggested Solution Describe options for analytical models. Describe considerations for cube design. 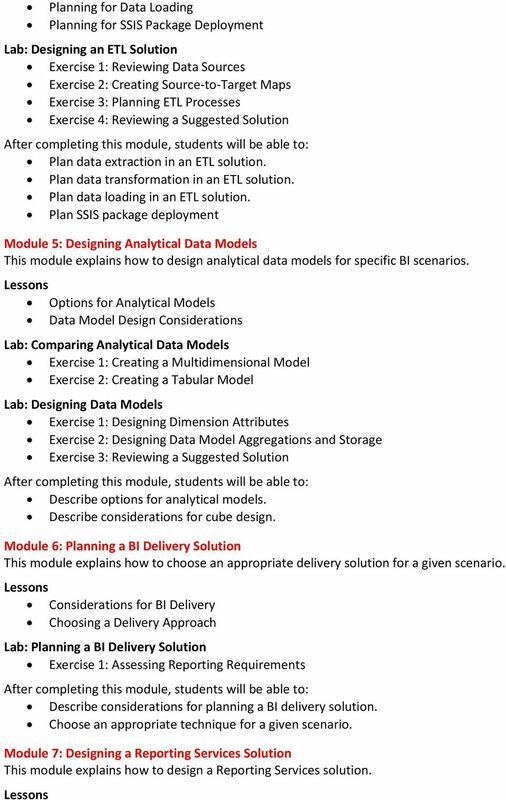 Module 6: Planning a BI Delivery Solution This module explains how to choose an appropriate delivery solution for a given scenario. Considerations for BI Delivery Choosing a Delivery Approach Lab: Planning a BI Delivery Solution Exercise 1: Assessing Reporting Requirements Describe considerations for planning a BI delivery solution. Choose an appropriate technique for a given scenario. 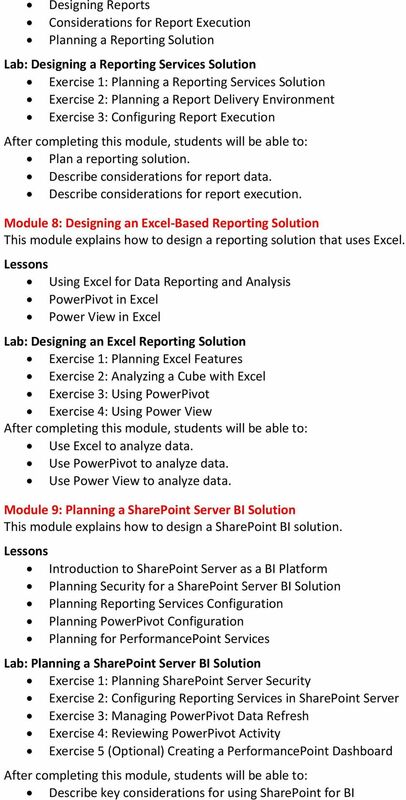 Module 7: Designing a Reporting Services Solution This module explains how to design a Reporting Services solution. 5 Describe key considerations for security when using SharePoint for BI Plan the deployment and configuration of Reporting Services in SharePoint Integration Mode Plan the deployment and configuration of PowerPivot Plan PerformancePoint Services in a SharePoint site Module 10: Monitoring and Optimizing a BI Solution This module explains how to monitor and optimize a BI solution. Overview of BI Monitoring Monitoring and Optimizing the Data Warehouse Monitoring and Optimizing Analysis Services Monitoring and Optimizing Reporting Services Lab: Monitoring and Optimizing a BI Solution Exercise 1: Monitoring and Optimizing a Data Warehouse Exercise 2: Troubleshooting Analysis Services Queries Exercise 3: Monitoring and Optimizing Reporting Services Plan BI monitoring. Plan data warehouse monitoring and optimization. Plan Analysis Services monitoring and optimization. 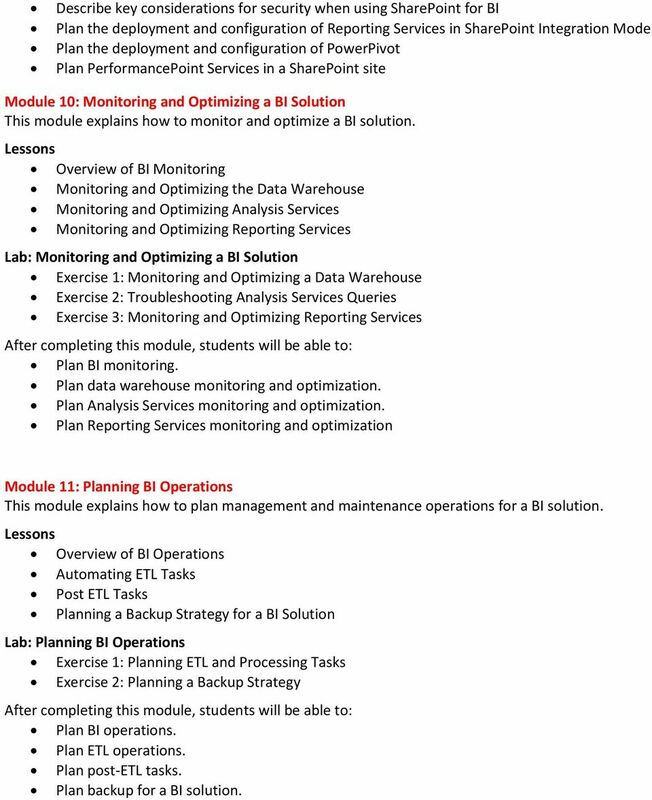 Plan Reporting Services monitoring and optimization Module 11: Planning BI Operations This module explains how to plan management and maintenance operations for a BI solution. Overview of BI Operations Automating ETL Tasks Post ETL Tasks Planning a Backup Strategy for a BI Solution Lab: Planning BI Operations Exercise 1: Planning ETL and Processing Tasks Exercise 2: Planning a Backup Strategy Plan BI operations. Plan ETL operations. Plan post-etl tasks. Plan backup for a BI solution.